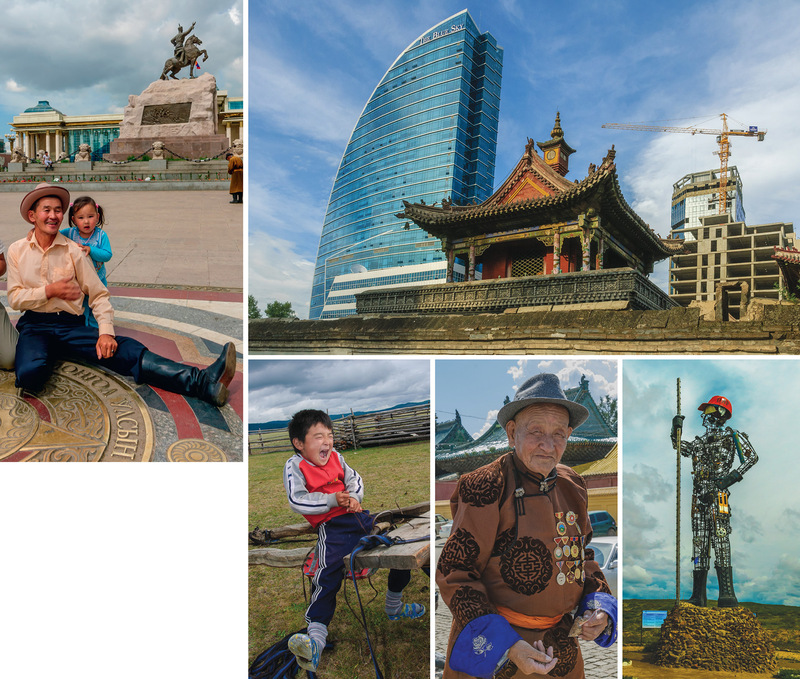 Clockwise from top left: Wealthier nomads visit the capital on holiday, or retire there; the old and the new (and, until recently, the incessant construction) in the Ulaanbaatar skyline; a metal colossus celebrating the construction of the Darkhan Metallurgical Plant; a Mongolian hero of World War Two feeds pigeons in the streets of Ulaanbaatar; but the traditional life on the steppes goes on, as Degi demonstrates how he practises horse riding. The boom in Ulaanbaatar is over. From 2010, an international scramble to invest in Mongolia’s mining sector (copper, coal and gold) filled the capital’s bars with foreign bankers and its skyline with construction cranes. Between 2009 and 2014, Mongolia’s economy grew by 70 per cent. But since 2015 a slump in global commodity prices and an economic slowdown in China – the destination for 84 per cent of Mongolia’s exports – has led to a decline. To make matters worse, after Mongolia welcomed the Dalai Lama in November 2016, China imposed new tariffs on Mongolian imports and delayed trucks at the border. Times are hard. High unemployment, rampant inflation and a collapse in the value of the tugrik – which has depreciated 50 per cent against the dollar since its 2009 peak – are causing misery for millions of Mongolians. During the boom years, cash from the mining industry created jobs and fuelled government spending. According to World Bank data, poverty rates dropped from 39 per cent in 2010 to 22 per cent in 2014. Government-subsidized mortgages helped people move out of shantytowns on the edge of Ulaanbaatar – camps of gers with coal-burning stoves and no running water. Many of these migrants have now moved into affordable apartments in the city. But the mortgage programme that transformed many Mongolians’ lives contributed to a real-estate bubble; prices in the capital jumped by as much as 20 per cent. Now the construction and real-estate sectors are in trouble, as are the banks that lent to them. Consequently, earlier this year, Mongolia’s government successfully sought a loan from the IMF. But, to meet IMF conditions, spending on healthcare, education and child benefits have been cut. Rising metal commodity prices in the first quarter of 2017 have sparked optimism that the economy is about to rebound. But the nation’s ‘resource curse’ not only exposes Mongolians to boom-bust cycles, but also contributes to environmental degradation that is destroying traditional nomadic ways of life. Enke, a herder and local wrestling champion, knows his 15-year-old son Degi will not follow in his footsteps. Mining and climate change are affecting grazing grounds and watering holes. The natural disaster Mongolians call dzud – summer droughts and harsh winters – used to be infrequent. But there have been five since 1999, including for several consecutive winters. Nomads cannot find pasture and water to graze their livestock. 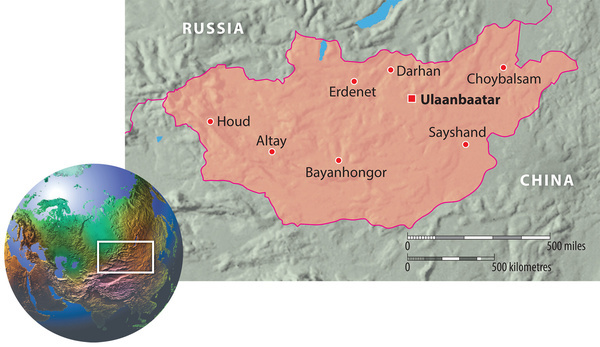 When herds starve, more families bring their gers to the polluted suburbs of Ulaanbataar. In June 2016 the Mongolian People’s Party (MPP) won an 85-per-cent majority in parliamentary elections by promising to reinvigorate the economy with friendlier attitudes towards foreign investors. Since 1990, Mongolia has been a democratic enclave in an autocratic neighbour­hood. But, after 70 years of communist rule, Mongolians do not take their democracy for granted. Herders in the Gobi ride for days to vote. The government sends out trucks with mobile ballot boxes across the vast steppe to collect the votes of those too infirm to trek to the polls. Since winning power, the MPP government has created a more permissive environment for inter­national firms: for example, it reached a deal with Rio Tinto for a multi-billion-dollar investment in the Oyu Tolgoi copper mine. But students, environmentalists and herders are protesting the government’s mining-led development strategy. Corruption remains rife. In May 2016, leaked papers from the Panama law firm Mossack Fonseca revealed substantial offshore holdings by 49 Mongolians, including former prime ministers. Many protesters feel that dependence on mining only widens the wealth gap. But in their ongoing efforts to hold their government to account, they may need the tenacity of Chinggis (Genghis) Khan. Although Mongolia is ranked ‘free’ by Freedom House, recent cases of media harassment, police brutality and corruption in the judiciary are worrying developments. In April 2017, to protest new laws harshly punishing journalists accused of defamation, Mongolian television screens went blank. Normal programming was replaced by a red text warning about threats to media freedom. 70 years, up from 60 years in 1990 (China 76, Russia 70). Culturally, Mongolia is one of the most gender-equal countries in Asia. Partly this is thanks to the legacy of Chinggis Khan, who considered his daughters more competent leaders than his sons. 98% – up from 82% in 2000. Homosexuality has been legal since 1961 but discrimination against sexual minorities is endemic, especially in the provision of public services and goods, such as justice, healthcare and education. 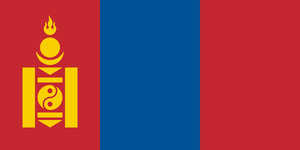 Following its peaceful revolution in 1990, Mongolia has become a democratic, multiparty state in a region characterized by authoritarian rule. Political corruption, however, is endemic, undermining good governance and weakening public confidence in political institutions. Politicians’ predilections for short-term populist promises further undermine confidence in Mongolian democracy. In 2016, the two main parties colluded to change from a proportional to a pluralist or first-past-the-post electoral system so as to prevent other parties from participating in government. Head of state President Khaltmaa Batulga; head of government Prime Minister Jargaltulga Erdenebat. GNI per capita $3,550 in 2016, down from $4,280 in 2015 (China $7,400, Russia $13,220). The World Bank categorizes Mongolia as a low-middle-income country. Copper, coal, gold, cashmere, wool, livestock, animal products, fluorspar and uranium. In the decade after 2000, foreign direct investment in extractive industries led the economy away from a traditional reliance on herding and agriculture. Exports now account for more than 40% of GDP. Mongolia depends on China for more than 60% of its external trade and on Russia for 90% of its energy supplies. 3.0 million. People per square kilometre 2 – Mongolia is the world’s most sparsely populated country. Annual population growth rate: 1.25%. Infant mortality rate 19 per 1,000 live births (China 9, Russia 8). Lifetime risk of maternal death 1 in 800 (Russia 1 in 2,300). HIV prevalence rate 0.02% in 2015. Alcoholism is a widespread problem. Major problems include water scarcity and desertification; urban air pollution; and general environmental destruction due to mining for minerals. The main Khalkh ethnic group accounts for 82% of the population. Minorities include Kazakhs 3.8% and Dorvods 2.7%. Buddhist 53%, None 38.6%, Muslim 3%, Shamanist 2.9%, Christian 2.2%. Mongolian (official) – predominantly the Khalkha dialect. Turkic languages and Russian are also spoken. 0.735, 92nd of 188 countries (China 0.738, Russia 0.804).